There’s loads to update you on in this blog installment, with many ‘firsts’ under my belt, including hosting a Trimcraft workshop and appearing for the first time on Create & Craft USA with presenters Christine McKay and Andy Hodgson. Presenting with Andy is so much fun, you never know what he’s going to say next! The similarity in our surnames was the subject of quite a few of the viewers’ emails, some asking if we were married! I had to point out that our names are spelled differently and we were not related in any way. Andy managed to make the joke last for most of our shows together. I had the chance to pair up with Alex for several shows too. I’ve presented with Alex before and she always looks after me. As ever, she was great fun and we had a giggle. I also had great fun on, and off-air with Christine. She saw things in the dies that I hadn't considered and so I created a demo inspired by some of her ideas. She loved using the dies and trying new things with them, like cutting the dog out of a picture of a fox so that the fur gave the dog texture. Brilliant! It’s been great crafting with the Simply Creative papers on air, the pads are so diverse and help you create both pretty and eye catching designs! The new First Edition dies work wonderfully with these gorgeous papers. We also tried something new this weekend with an online-only hour, catering for the clocks going back in the USA a week later than they did here in the UK. Christine and I showed how just one die set can be used for a whole range of crafting including scrapbooking, home décor, on top of cakes and other party décor. I can’t think of a better way to spend an hour crafting. Last week I hosted my first workshop. 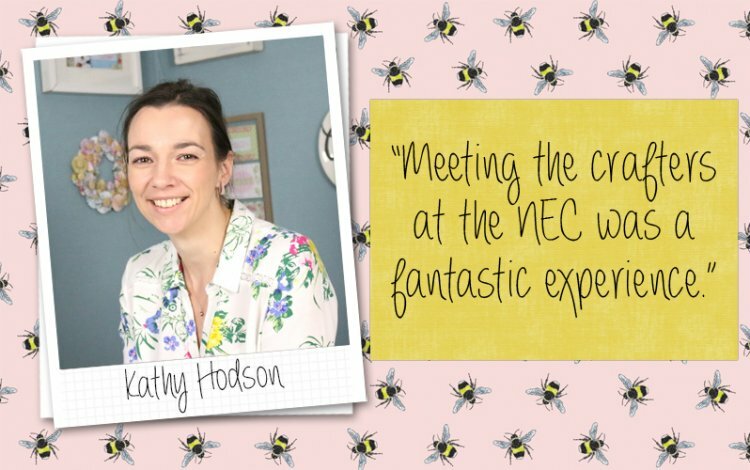 I joined the Create & Craft team at the Stitching, Sewing and Hobbycrafts show at the NEC in Birmingham. What an opportunity to meet a wonderful group of crafting ladies. We focused on the Trapeze fold card designed by Maxine, as this has been a huge hit with you all. Our workshop attendees loved it and they were also very excited about their Dovecraft Serendipity kits which they were given to make their cards with. It never ceases to amaze me how different people are inspired in completely different ways by the same materials. No two cards were the same and each attendee on the workshop made two cards each. They were all amazing creations. After the workshop I was approached by a lady who has been following the Trapeze Fold card tutorials and video on the Trimcraft web site. She had a few questions about it and I was delighted to be able to help her. She came to the show with her friend who is a regular contributor to the Project Gallery. Keep up the inspirational work ladies! The next few weeks will bring more shows on Create & Craft TV focusing on more Dovecraft dies, brand new First Edition paper pads plus a 60 minute price drop show where there will be some amazing bargains to be snapped up so keep your eye out for that. Don’t forget to keep in touch via my social media pages – search for Kathy Crafts TV – and let me know if there is anything you would like to see more of during my demos.